In addition to his comments about the Irish in America, Hurlbert also made numerous references to the U.S. Civil War, which he witnessed a quarter century before his visit to Ireland. “Hurlbert’s home country and its history were never far from mind as he explored the Emerald Isle,” historian Daniel Crofts wrote in his book about the 19th century American journalist. This phenomenon, unique in American history, is to be explained by only three causes, all active in the case of congested Ireland,–a decaying agriculture, lack of communications, and the absence of varied industries. Not once, but a hundred times, during the visits to Ireland recorded in this book, I have been reminded of the state of feeling and opinion which existed in the Border States … of the American Union … For today in Ireland, as then in America, we find a grave question of politics … seriously complicated and aggravated, not only by considerations of moral right and wrong, but by a profound perturbation of the material interests of the community. … [I]t would be uncandid not to say that the optimists of Maryland, Virginia, Kentucky, Missouri, and Tennessee had greater apparent odds in their favor [for reaching a peaceful solution] in 1861 than the optimists of Ireland seem to me to have in 1888. Ireland stands to-day between Great Britain and the millions of the Irish race in America and Australia very much as the Border States of the American Union stood in 1861 between the North and the South. … [T]he Border States enjoyed all the advantages and immunities of ‘Home Rule’ to an extent and under guarantees never yet openly demanded for Ireland by any responsible legislator within the walls of the British Parliament. But so powerful was the leverage upon them of conflicting passions and interests beyond their own borders that this sovereign states, well organized, homogeneous, prosperous communities, much more populous and richer in the aggregate in 1861 than Ireland is to-day, practically lost the control of their own affairs, and were swept helplessly into a terrific conflict, which the had the greatest imaginable interest in avoiding, and no interest whatever in promoting. [Hurlbert’s] dour warnings about how the Irish situation might trigger a civil war were not fulfilled during his own lifetime, but he was correct to predict that the struggles of the 1880s could have a violent sequel [and did in the Irish War of Independence and Civil War, 1919-1923]. … The conflict that led to partition [in Ireland] was mercifully less bloody than the American Civil War, but it was bad enough [and] persisted for the rest of the 20th century. 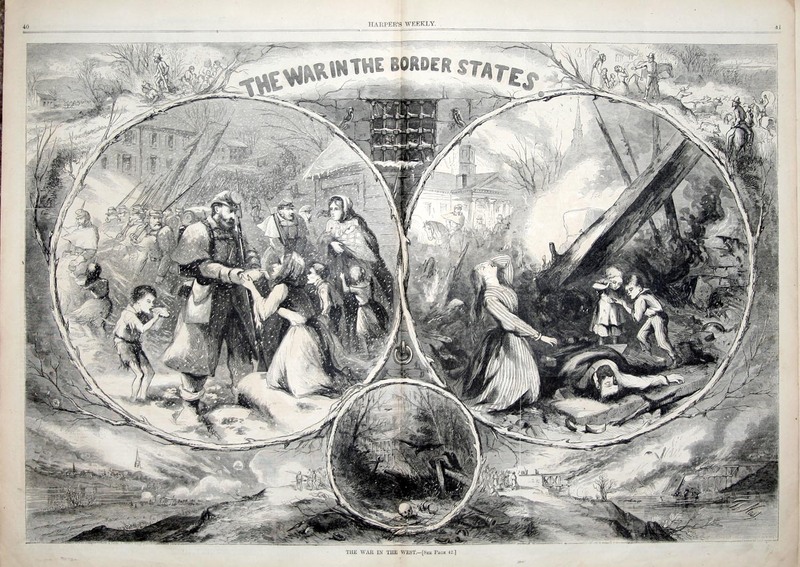 “The War in the Border States,” by Thomas Nast. Published in Harper’s Weekly, January, 1863. NOTES: From pages 145, 220, 394, and 417-18 of Ireland Under Coercion: The Diary of an American. Pages 183-84, 186-87 of A secession crisis enigma : William Henry Hurlbert and “The diary of a public man, by Daniel W. Crofts. This entry was posted in History, IUC, Revisted, Politics, Uncategorized and tagged 1867 Fenian Rising, Daniel W. Crofts, Irish Civil War, Irish War of Independence, U.S. Civil War on June 5, 2018 by admin.